The Pentax KP comes equipped with the innovative sensor-shift-type SR II (Shake Reduction II), which assures optimum compensation effect for all lenses. In addition to common camera shake caused by pitch and yaw, this five-axis mechanism also compensates for camera shake caused by horizontal and vertical shift (often generated in macro photography) and camera shake caused by roll, which is difficult to handle by lens-installed shake reduction mechanisms. Thanks to a wide compensation range of five shutter steps, it benefits a number of handheld applications, such as when using a telephoto lens or shooting in poorly-lit locations, to capture sharp, blur-free images. 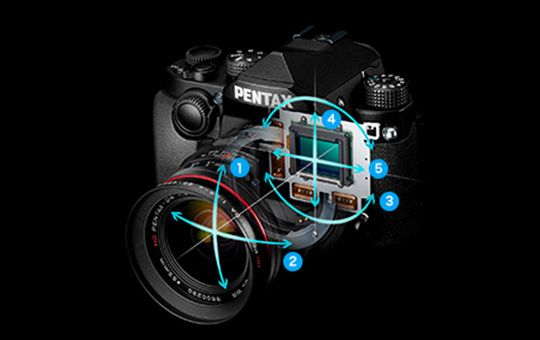 When taking a panning shot, the PENTAX KP detects the direction of the panning action, then controls the SR II mechanism to compensate for all other affecting vectors. It captures beautiful, high-resolution images both in normal shooting and panning photography, without requiring any switching operation. This entry was posted in Pentax K-3, Pentax KP and tagged Pentax Shake Reduction II. Bookmark the permalink. Trackbacks are closed, but you can post a comment.